The Thunderbird is coming apart. 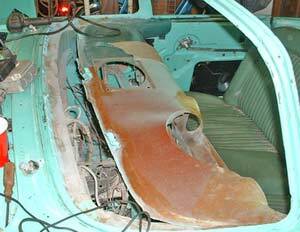 Once it was positioned in the garage we removed the hard top, hood and trunk lid and stored them away from harm. We then went through all the boxes of parts in the trunk and sorted out what was in good condition, what wasn't, and started a list of missing pieces. In the process we discovered a number of missing interior trim pieces, so the budget will have to bulge a little to compensate. The next thing on the agenda was to get the engine started. This is important because we needed to know if it is in decent enough condition to rebuild. If not, we would have to consider replacing it with a more modern engine. The engine hadn't been run since 1994, so there was no way to know its condition. The old 6-volt battery would crank the engine, but a test of the ignition showed the weakest of sparking at the plugs. We decided to make things easier by installing a 12-volt set of points and temporarily wiring up a 12-volt coil. These would be energized by a battery charger and we'd use the battery just for cranking. We'd also hook up a timing light to see if we were anywhere near the right adjustment for running. Before going further we clamped the fuel line at the pump to prevent any old, rusty, contaminated gas from being delivered to the carburetor. Once everything was wired up we cranked the engine and adjusted the distributor to get the timing marks close enough for running (they were about 40 degrees off). Then, after cranking for about 30 seconds to pump up oil pressure, we sprayed some ether into the carburetor. The engine fired immediately, so we wired up a 12-volt fuel pump and connected a rubber line from it to the input line of the carburetor. The other end of the pump's line was placed in our gas can. Aside from some leaking in the carburetor, our fuel system worked well enough to get the engine running. It smoked (blue smoke, indicating oil burning) quite a bit but ran very smoothly and quietly. That gave us enough confidence to pronounce it in good enough shape to be rebuilt, so we shut it off and disconnected our temporary apparatus. 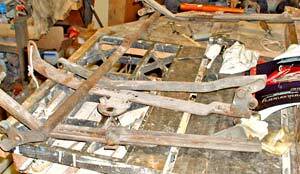 In preparation for removal of the body from the frame we started removing everything from the car's interior. We spent about 1 hour under the dash, removing every switch, control, gauge, lamp and trim piece. These were placed in a box for later restoration. 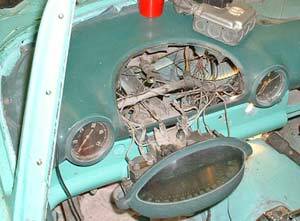 Steering wheel, radio, switches, heater all have been removed. Speedometer and gauges module comes off. The next thing to remove was the seat. All T-Birds had power seats in 1955, and the mechanism was fairly complex. We unbolted the track assembly from the floor and then uncoupled the two electric motors underneath. Once the seat was turned over we could remove the framework from the seat body. Nobody told us the whole dash would easily come out. The moving framework was in sorry condition. The tracks wouldn't slide at all and two pivot arms were broken off. We decided to take these parts into the workshop and do the repairs right away, then paint the pieces and store them for later. The seat framework as it arrived in our workshop. To fix the tracks we had to disassemble them. This was done by bending back the stop pin on each, then pulling the track over the two large ball bearings inside (actually, due to the extent of rust we had to hammer them apart.) 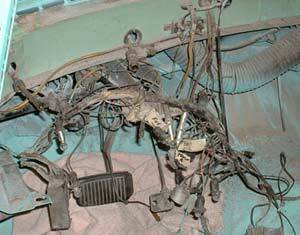 Once disassembled, we cleaned the parts in solvent and then wire brushed the pieces to remove the rust. We cleaned and polished the ball bearings and then reassembled the slides with new grease. 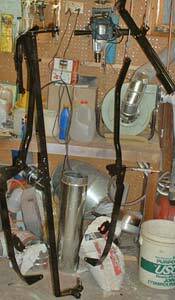 To replace the pivot arms we cut an appropriate length of bar stock and chucked it in the lathe. We turned down one end to the correct diameter to fit into its pivot assembly, then turned the other end to 1/2 inch diameter. We drilled the arm end with a 1/2 inch bit and then pressed in the new pivot arm. Seat tracks painted and ready to be stored out of harms way. The other pivot arm was intact, but its threaded end was broken off. We cut this end flush, then drilled a 1/4 inch hole into the arm. We then threaded this hole to accommodate a 1/4-20 bolt. This would be a perfectly acceptable means of retaining the pivot assembly. Once the repairs were made we wire brushed the pieces and then primed and painted them in black. After the paint cured we reassembled the framework and tested it for ease of movement. We then wrapped it up and stored it away. While working on the seat frame we decided to pull the two electric motors off their mounts and test them for operation. First, however, we had to clean 50 years' worth of dust and grease out of them, which necessitated disassembly of the lead-screw drive mechanism. With those in the solvent bath we turned our attention to the motors themselves. We didn't have a schematic of the wiring, so we tested various combinations of leads using a low-amperage setting on a 6-volt battery charger. We were able to get the motors to spin in both directions, but there was no appreciable torque. That is, we could easily stop their rotation by grabbing the shaft with two fingers, which meant there was no way these little motors could move the seat. This exercise forced us to disassemble the motors themselves to clean things up and make sure the windings were intact (used motors cost $350, by the way, and new ones are even more expensive). We removed the rest of the interior components, including the parking brake assembly and door hardware. The heater assembly came out as a unit. The wiring to the engine was disconnected, after which we removed the throttle linkage, hood latch, starter solenoid and everything else on the firewall. This left the body bare and ready for removal from the frame.